Our office is feeling a bit like Santa’s workshop these days. We are hard at work on our fifth version of Airport Madness. Back in July, when I decided that there would be a fifth version, I made a clear rule that our assembly line be super efficient, capable of building additional game levels with ease. But of course, this game has taken on a very interesting shape, and now contains a great deal of complexity. The efficiencies that we built in early on are now feeling rather slow and antiquated. It really amazes me how much code is required to drive a few planes around. In Airport Madness, an aircraft must have a reasonable degree of logic. It must have the ability to recognize a runway that it isn’t supposed to cross. And know that it must wait for a parking gate that’s occupied. A 747 must know better than to attempt to park at the flying school, and vice versa. No Piper Cubs are allowed to park directly in front of the main international terminal. Conflict management is complicated, too. I’m not just talking about the ability to detect collisions. When two taxiing aircraft are converging, they must mutually decide who will give way, and who will keep taxiing. This requires a bit of trigonometry magic (anyone remember inverse tan?). It gets interesting when you have four or five aircraft in a cluster. Sometimes you get a dead-lock, a stale mate. There must be logic that deals with this. In the fifth edition of Airport Madness, your airport grows. Slowly. And as the little changes are introduced year after year, the code must change with it. In 1938 I decided to lengthen a runway. This means every aircraft must understand the specific new taxi routes, arrival routes, and departure routes. But only for that particular year, because in 1939 high speed exits get added, and every aircraft must now understand these new routes, too. The biggest nightmare I think has to be the artwork. Our artist must be an architect, an airport designer, a city planner, and must be an expert at dealing with people like me. The game’s timeline is very delicate, as airport and city objects are in a constant state of either generation or destruction. The artwork for AM5 is going to be truly amazing. There’s a great deal of it, and it’s demanded that we be as efficient as possible with regard to the user’s CPU, GPU and system memory. We will keep you posted as we make progress! 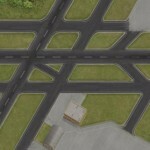 This entry was posted in Airport Madness 5 on December 4, 2012 by admin.